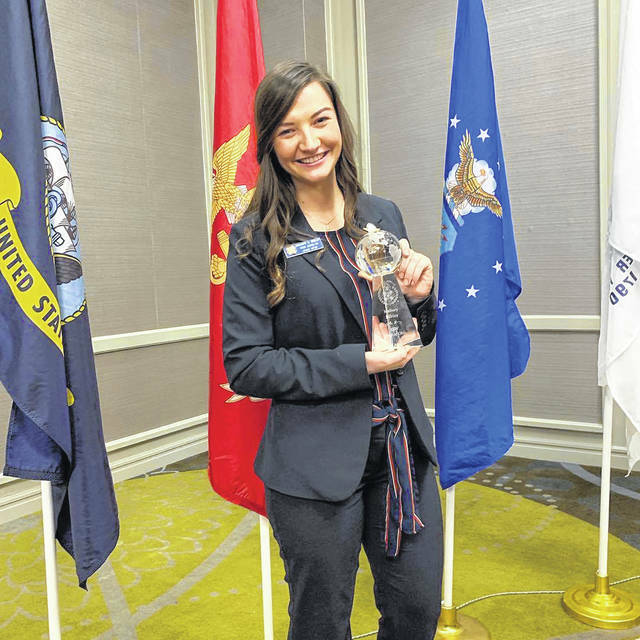 Mallory Bibler, a senior at Hayes High School, is pictured with her second place state level prize from competing in the “Voice of Democracy: Why My Vote Matters” audio essay competition, a contest run by the Veterans of Foreign Wars. A Delaware Hayes High School senior took home second place and more than $6,000 in scholarships in a audio essay contest held earlier this month. Mallory Bibler said Thursday that last semester, one of her teachers encouraged her to write about why voting matters and later encouraged her to submit that speech for the “Voice of Democracy: Why My Vote Matters” audio essay competition, a contest run by the Veterans of Foreign Wars. Bibler said she had never heard of the competition and didn’t plan on submitting until her teacher, Michelle Howes, told her to record the essay on a CD and submit it to the contest. Bibler said she won first place at the Delaware VFW post, received $150 in scholarships, and was invited to the district awards ceremony. Bibler said the organization sent her a packet about the state competition in the mail ahead of the district award ceremony, which spoiled the surprise that she had won first place at the district level with a prize of $1,500. On Jan. 12, Bibler took second place among students from the 12 districts in Ohio, and she was given a prize of $5,000. Bibler said after she returned to school following the state prize, she was congratulated by Principal Richard Stranges and many of her teachers. Bibler said after she graduates in May, she’s planning on studying at The Ohio State University, where she’s considering majoring in communications. The speeches of all 12 district winners were recorded and will be archived in the Library of Congress, the VFW reports.